We approached Dorianne Almann from North East Rottweiler Rescue & Referral to request a Rottweiler Rescue Interview. Dorianne is the President of NERR&R and has given us great insight into rescue. 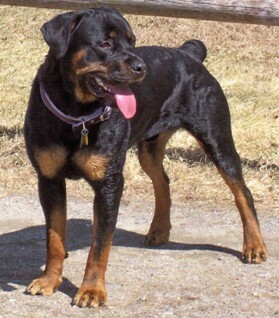 She has provided pictures of three Rottweilers that she has fostered. The first is of Moxie, the dog pulling the cart. Moxie is pictured with Dorianne, and is her forever girl. She was fostered back in 2000 after being left in a shelter in Maine when she was about five months old. The second picture, below, is of Sailor. Sailor was picked up by animal control, wandering the streets of Hartford, CT. He was in very bad shape and Dorianne fostered him until he was in good health and ready to go to his forever home. And finally there is Boomer (last pic). Boomer's mom couldn't care for him properly, so she gave him to her father. Wanting the best for the dog, he surrendered Boomer to rescue. Dorianne fostered Boomer until she found him his forever home. I hope you enjoy this Rottweiler Rescue interview! 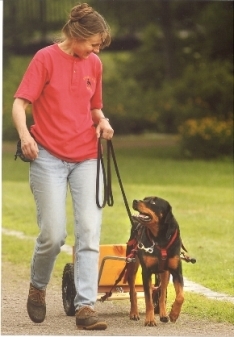 I noticed on the website, www.rottrescue.org, that NERR&R has been operating for ten years now. That's fantastic. How many Rottweiler's have been rescued in that time by NERR&R? We have rescued and rehomed 1,142 dogs. How has your Rottweiler rescue managed to stay in operation successfully for so long? By running our organization professionally. The sheer numbers of dogs needing help can easily be overwhelming. We regretfully understand we can’t help all the dogs needing help. NERR&R focuses on a specific geographic region—primarily the New England states. We only rescue and rehome in this area because this is where we have volunteers, this is where we have a network of trainers and behaviorists to whom we can refer people, this is where NERR&R has the resources to support adopters of our dogs. We also understand the type of dogs our adopters want to make part of their families—people who adopt from us are looking for safe family pets. We don’t take aggressive dogs nor dogs with a known bite history into our program. We want our foster families to be comfortable and happy with the dogs they’re fostering because this means the adoptive family will also be comfortable and happy with the dog they adopt. Hands down, it is the shortage of people willing to foster. Since all the dogs in our program live with a family like yours and mine, NERR&R’s ability to help is directly related to the number of foster families we have. We’ve never had enough foster homes! What are the most common reasons dogs end up at your rescue? The most common reason dogs end up in rescue groups is because people buy or get dogs inappropriately--from a pet store, from an ad in the paper placed by a back yard breeder, or from a neighbor or friend whose female had a litter of puppies. Getting a dog from such places is a mistake for many reasons--there’s no one who understands the importance of health clearances and sound temperament when breeding, there’s no one to do any screening of potential puppy owners, there’s no one to stress the importance of socialization and training, there’s no one to whom the puppy buyer can turn to with questions. So, ill-prepared puppy buyers often become frustrated when their adorable, cute puppies grow up into large, unruly, untrained dogs they can’t control. Since there’s no responsible breeder to take such dogs back, overwhelmed owners look to rescue. In general, why should people adopt from a rescue? Good, bona fide rescue groups screen the dogs in their programs. They temperament test their dogs. Their dogs live with a foster family. They work hard to match the dog to fit the family’s life style and their level of dog experience and knowledge. They will take the dog back if needs be. They are there for you throughout the life of your adopted dog, providing advice, support, and help if you need it. What do you think the biggest misconception is about Rottweilers? That they are mean, tough, aggressive dogs. There is no finer dog than a Rottie with a sound temperament, who has had solid, consistent training, who is treated fairly, and who is living as part of his or her family. Thanks for doing this interview Dorianne! If you are from RI, CT, MA, NH, VT, ME, northern NJ, or southeastern NY, please consider supporting North East Rottweiler Rescue and wonderful dogs just like Boomer, Sailor and Moxie. 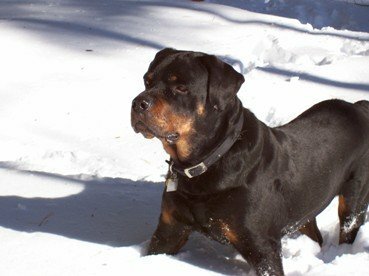 Would you like to read other interviews like this Rottweiler Rescue Interview? Please click here to read more Pet Adoption Interviews (leave this Rottweiler Rescue Interview page).